The travelers included Alumni Association President & CEO, board members, alumni staff, friends, and even a UI student. A new chapter has opened in the enduring relationship between the University of Illinois and China. Under the auspices of the University of Illinois Alumni Association and with corporate sponsorship from the UI Employees Credit Union, a delegation traveled to Shanghai and Beijing for an Alumni Summit in China Nov. 3-10, meeting with Illini clubs in both cities. The group of 54 also visited Tsinghua University, which has longstanding ties to the U of I, and toured some of China’s foremost cultural sites. “This is historic,” says Loren R. Taylor, UI Alumni Association president and CEO. “Never before have so many of our alumni leaders visited another country as one delegation to serve as true good-will ambassadors for the University and the Association.” Taylor was among the group, which included members of the Association’s governing board, alumni, staff, friends and a UI student who served as an interpreter. The weeklong visit coincided with the announcement of the University’s new office in China, scheduled to open in Shanghai on Dec. 9. 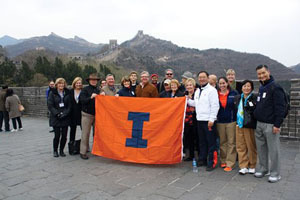 Receptions with the Illinois Alumni Clubs of Beijing and Shanghai provided a special glimpse into Illini spirit abroad. “I was really impressed with the number of alumni who have connected with each other through our clubs in China,” says Amy Eichhorst, UI Alumni Association vice president, alumni advocacy and outreach. UI Alumni Association board member Bo Zhang, MS ’92 ENG, PHD ’99 ENG—whose life story arcs from an impoverished childhood in China to major entrepreneurial success both in the U.S. and his home country—helped plan the group’s itinerary. Participants toured Tian’anmen Square, the Forbidden City and Shanghai’s Old City Bazaar, among other destinations. A visit to Tsinghua University in Beijing had past, present and future significance. Chinese architect Tsin Chuang, UI Class of 1914, manifested his esteem for Alma Mater in the Tsinghua Quad, which he modeled after that of the Urbana campus. Tsinghua engages with U of I in collaborative partnerships across a range of disciplines, particularly engineering. The vibrancy of the relationship between U of I and China has also impelled the University’s decision to open an office in Shanghai. Part of a larger presence by the state of Illinois and U.S. Chamber of Commerce, the office will provide connections for prospective students and Illinois alumni in China, and build ties with companies, research entities and institutions of higher education there. Chancellor Phyllis M. Wise is expected to host the Dec. 9 opening of the office. For more stories like this one delivered directly to your home, join the University of Illinois Alumni Association!